2) Years collaging? Four, I guess. Who knows where the time goes? I started playing around with collage in mid-2013 but didn't get "serious" about it until maybe a year and a half later. 3) What do you love and hate about collage? I think the thing I love most about collaging is that it feels free and spontaneous in a way other artistic endeavors haven't for me. When I sit down to collage, I never have any idea what I'm going to end up with, if anything. Collaging feels much less premeditated or prone to certain expectations. What I dislike most is a bit specific to my situation and not necessarily to collage in general, which is that I work out of my tiny apartment and like to keep my home tidy, so there's a fair amount of setup and cleanup every time I want to collage. It isn't always easy going from zero to collage, so it'd be nice to have a real studio where I can spread out, make a mess, cut down on the warm-up time, and pick up where I left off. I also hate what I call "landmines", which is when the tiniest tip off your X-Acto blade breaks off and embeds itself into your mat and you discover it much later when you're cutting something and the blade you're using slips and ricochets off it and breaks or nicks and messes up the cut your making. 4) Biggest influences? In terms of collage, my biggest influences are Jay Riggio and Michael Tunk. When I first started collaging, I was quite private and embarrassed about it - it kind of felt like the path of least resistance artistically, like I may as well be tracing my hand and drawing it into a turkey or pasting with popsicle sticks and macaroni. A friend turned me on to Riggio, and prior to being exposed to his work, I didn't know that anyone over the age of eight was even making collages. The collages I'd made up to that point were these Winchester-Mystery-House-of-collage pieces that I just kept adding more and more to over the course of a month or something. I had no idea you could use fewer images and create something bold and striking that tells a story. Of course, I've since encountered countless really talented and idiosyncratic collage artists, so I guess it's a thing after all. Tunk's on a whole other level. He has an incredible knack for composing scenes and characters that look like they were designed that way to begin with, not as though they were built from unrelated components. The colors and textures all make perfect sense and the whole piece exists as a cohesive unity. He also wins the award for sweetest person generally. He only lives a few miles from me, I should really glom onto that guy more and catch some of his reflected glory. The top five things I've tended to listen to while collaging in terms of frequency are (in no particular order): "The Golem (Rock Album)" by Black Francis, "Apocalypse Discussion" by Adam Payne, "For the Recently Found Innocent" by White Fence, "Rough Frame" by The Art Museums, and "In the Soul Kitchen" with Harry Duncan, Sunday nights at 8 on KCSM, "the Bay Area's jazz station". 5) Analog Vs Digital? 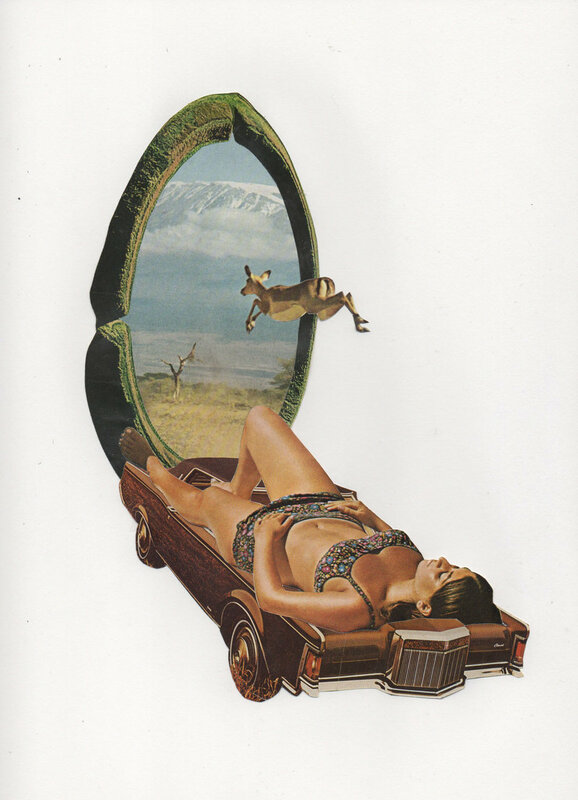 I'm an analog collage artist, mostly because I don't understand computers and never really learned how to use any sort of art software. Also, it just seems like with such technology "these days" the sky's the limit, and I think an element of making something soulful means having to work within certain limitations and creating something interesting despite them. Like, why stop at just using an image of a cat? Why not make it dance and sing "Take Me to the River"? If any digital artists happen to read this and start composing threatening letters (which would be pretty ironic, actually), I'd like to remind them I've never even tried it and have no idea what I'm talking about. 6) How do you spend your downtime? Collaging is my downtime, man! I labor at a day job for a living. Collaging for me has always been about spontaneous creativity and getting out of my own way and not judging myself. I've probably made $100 in the four years I've been making collages. It's been really nice when I've sold pieces, and I'd love if it happened more often, but I also can't imagine having iPhone cases or bedsheets made, you know? I used to draw comics more, but collage sort of took over. It goes back to that creative freedom thing I keep bringing up. I think I consume so many comics and graphic novels that I hold myself to much higher and more specific standards. I kind of consider myself the Happy Gilmore of collage: I fancy myself a cartoonist, but translating that slapshot to collage seems to be working out better for me. That and I'm sponsored by Subway. I also play music, after a fashion. I spent the last several years playing in several rock groups (and cover bands because I'm old), but these days I prefer a quieter, more introspective form of self-expression that doesn't include as much loud noise and public joy. 7) Three tips for someone starting out in collage? First, that 'perfect' is the enemy of good. Don't get hung up on trying to make something come out just right. If a piece isn't working, scrap it and move on. Likewise, if it has everything it needs, stop there - more isn't always better. Knowing when to say "done" is a critical and oft-overlooked part of the creative process. The early days are just about doing it a ton and finding your voice. The perfection will come later. Or maybe it won't and you'll find a more worthwhile use of your time. Good for you. Second is keep your sources fresh. I get bored with my materials really easily and then start beating up on myself and thinking things like if I was a real artist I would find a unique way of using that image I think of as chaff. (Pro tip: use those 'chaff' images to do your gluing on!) Or you can go practically anywhere and find a fresh book or magazine or whatever to cut up and actually enjoy your experience collaging/limited time on earth etc. Lastly, if you're really just starting to make collages, get those Elmer's reposition-able glue sticks. That way you can harmlessly recover from fuckups until you figure out your method of how to combine images and what will and won't work for you without the mess and permanence of spray glue and stuff like that. Also, Mod Podge never. Especially if you're using older materials or things printed on cheap paper. Or just, like, make them digitally and avoid glue and mess altogether, I guess. 8) Up and coming shows or projects we should know about? I heard I might be featured in "Downtime". Otherwise, nope. Anyone in the "thriving" and "vibrant" Bay Area art world wanna hook it up? These days it appears that to get anywhere, regardless of the form you work in, you not only have to be the artistse but a marketing shark as well. And those temperaments seem antithetical. There's this record store I like that shows art, and I keep starting an email to them, but seeing myself say things like "I'm an Oakland-based artist who has previously been featured locally..." and so on makes me want to punch myself. Clearly I need an agent. And one who will work for $100 every four years.